For Valley artist and illustrator Rebecca Guay, there’s one main thing that makes a work of art worthwhile: its emotional impact. For Guay, that impact arrives via the human form. Her paintings depict a world in which mostly unclothed figures intertwine with nature and with each other, often caught in mid-movement. Guay searches, from the beginning, for the aspects of a work that, for her, evokes emotion. She looks for models with “timeless” faces, and for evocative gestures and movements. Though Guay has made a name as an illustrator for Magic: The Gathering, kids’ books and graphic novels, these days she’s focusing on large-scale paintings for gallery exhibition and sale. Those works reveal a distinctive aesthetic that mixes the modern fantastic with some of the trappings of 19th-century Romantics and the lush floridity of Art Nouveau. Her canvases teem with texture and color, and all of it seems to flow from the figure(s) that anchor the composition. It’s clear that her work is that of an accomplished technician, and that makes sense when she talks about the volume of her illlustration work. “The last graphic novel—a primarily fully painted book—not black and white—had 144 pages with six paintings per page on average. That’s over 800 paintings,” she says. “That’s only one book. Just prior to that, I worked on a book that had about 600 paintings. These books were produced over a two-year period collectively. I’ve done five graphic novels of equal size during my career, and hundreds of individual paintings for books covers and interior, while continuing to do the personal work and build up my current goals in gallery [work]. In an era when computers have made tremendous inroads into her profession, it’s all the more remarkable to see Guay’s facility with the old-fashioned tools of paint and canvas. About the arrival of digital tools, she says, “It’s impossible to relate how much computers and Facebook have changed everything. It’s like the printing press—there’s a before and after, and nothing is the same ever again. And it’s absolutely, in my opinion, an essentially positive change. My only caveat is that your artists move too fast to digital work and don’t learn all the true drawing and painting skills first. “I know I may get some grief for saying this, but digital is much easier than learning to oil paint or use watercolor. Like, so much easier. And I say this from total experience in both mediums. I can complete a digital piece so, so fast, which is also why illustrators often switch. You can move fast and book more clients, so I can’t blame anyone ever—I’ve done some jobs in publishing digitally for this very reason,” says Guay. Right now, on the heels of an exhibition at Northampton’s R. Michelson Galleries, Guay is continuing her painting and raising funds via Kickstarter for Evolution, her first comprehensive collection in book form. As for illustration work, Guay says she’s in the enviable position of being able to choose from the projects that interest her most. 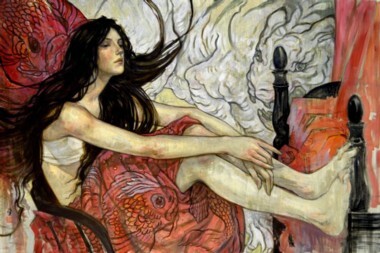 You can see more of Rebecca Guay’s artwork and see her Kickstarter campaign via rebeccaguay.com and rleveille.com. Her online educational work can be found at smarterartschool.com and illustrationmasterclass.com.